Buy this print from Society6. What are you afraid of? I ask myself this question a lot. It’s not because I’m afraid of scary movies or video games. I am not afraid of heights or tight spaces. My biggest fear is often being my true self. What does it mean to live truthfully? After all, we are supposed to present multiple versions of ourselves to the world. You wouldn’t act around your parents like you would with your closest friends. You wouldn’t act around your co-workers like you do with your family. We are all chameleons adapting to our environments. But the question is, Do we have to be? I often wonder about this, and I still don’t know the right answer. Is there even a right answer? I think the problem is, I haven’t defined who I truly am. What do I believe in? What values are important to me? What kind of person do I want to be? It’s okay to act differently in different situations. We don’t necessarily need to be the same person at every moment in our lives, but we should always hold the same values. We need to ask ourselves what we stand for. We need to live up to those truths no matter what. Because no matter what everyone else thinks about us, we are the ones who have to live with ourselves every day. If we can’t live by our own truth, what kind of life are we really living? If you are anything like me, you are tired of hearing all the terrible news around us. Whether it’s scandals, diseases, or death, it feels like the world is crumbling around us. If you regularly watch the news, you might think it’s best to never leave your home. I refuse to believe the world is such a horrible place. In fact, we are living in one of the safest times in human history. There are no worldwide wars. Most of us aren’t in danger of conquests, pillaging, or raids. So why are we all so worried? I believe there are two reasons for this. One is, fear sells, so the media tries to sell it to us as much as they can. The other is, we remember tragedy and travesty more than other things. So when we hear about bad things happening, they stay with us, even though we usually aren’t in danger. What can we do about it? I think the answer lies in kindness. Just think back to a time when someone was kind to you. How did it make you feel? How did it change your day? I’m assuming you felt amazing and wanted to carry that feeling with you. That’s the power of kindness. I admittedly could be more kind. Although I try my best to be kind to everyone I meet, I think I could do a hell of a lot better. I can be petty. I can be jealous. I get annoyed and frustrated. But that doesn’t mean I can’t also be kind. We tend to look at the world as either black or white. You are either mean or kind. We feel trapped in the box people put us in. It doesn’t have to be that way. You can choose to be kind even if you are afraid. You can be kind even as jealousy or frustration pulls on you from the inside. It’s all about your mindset. Anger, fear, jealousy, and greed are draining emotions. They weigh you down like a ton of bricks. Kindness, on the other hand, is an endless well. That doesn’t mean you have to be kind all the time. We are human after all. But the more kindness you spread, the more it comes back to you. If it is true that we are the sum of the five people closest to us, then the more kind we are to the people around us, the more kind they will be to us too. Don’t get trapped in the cycle of fear and hatred. Just listen to the Golden Rule and treat others the way you want to be treated. If you’re anything like me, you’ve probably heard your fair share of those two words. I especially heard them when I was a kid. I was an admittedly awkward child. When I switched elementary schools in third grade, I didn’t want to talk to anyone. While it’s normal for kids to avoid talking to strangers, it isn’t normal when you don’t talk to kids you see in class every day. That was me. I couldn’t tell you why I didn’t talk to the kids in my class. But at some point, it went from me being shy and uncomfortable, to me enjoying the attention. Every day kids tried to get me to open up, but I stood steadfast in my no speaking policy. I realized not speaking was something that helped me stand out. When you’re a kid, being weird is fine. People will often embrace that weirdness. But once you become a teenager, being called weird is like a Scarlet Letter. It’s no longer okay to be yourself. You have to fit in. But, the thing about being weird is, it’s what helps you stand out from the crowd. While all those kids who tried to conform to the norm got normal jobs, the weird people are the ones who stand out the most. The thing is, people who are weird are unafraid of breaking from the mold. They don’t care if people know about their interesting quirks. It’s those quirks that give us the edge over everyone else. While most people are doing their best to blend in with the crowd, weird people are intentionally trying to stand out. The next time someone calls you weird, don’t consider it as a mark of shame. Wear it like a badge of honor. After all, those who embrace their weirdness stand out like a shining star. Love me or Hate me but at the end of the day u will RESPECT me!! No matter how nice you are, no matter how hard you try, people will end up hating you or your work. It’s not because you did something wrong. Unfortunately, it’s just the way some people are. You can’t please everyone all the time. I grew up thinking I could get everyone to like me. I never got into confrontations. I always tried to play the middle road when possible. The problem is, even when you keep to yourself and do your best, people still ridicule you. It took me a while to figure this out. Why was I getting ridiculed for getting good grades? Why did people make fun of my art? I just wanted to make everyone happy, but the reality is, you can’t. The great thing is, that lesson is a valuable one to learn. We can’t and shouldn’t try to please everyone. We have to embrace the people who love our work and ignore the people who don’t. People can hate your work all they want, but taken in another light, it’s a sign of respect. If you are creating uninteresting work, people will just ignore you. The fact that most people love your work and some people don’t is the ultimate compliment. It means you are creating work that is worthy of criticism. Instead of trying to go out there and please the masses, embrace the haters. Learn that lesson I had to go through long ago. When you are at the top, people will try to bring you down. Use that as fuel to push you further. In school, I was always scared of getting an answer wrong. Red marks across a test or paper would make me cringe. What did I do wrong? I studied so hard. I wanted my grades to be perfect, but perfection was often unattainable. I’m sure you’ve felt that same fear and embarrassment too. We have been conditioned to always strive for perfection, even if it is unattainable. Our schools punish kids for their failures, but is that the best way to teach our future generations? They condition us to find the one right answer, but there is rarely ever one solution to a problem. Those lessons often translate to our lives outside of school. Most companies are searching for people who can come up with innovative solutions. On the other hand, we expect companies to tell us exactly what to do. We have been conditioned not to take chances. We look at mistakes and believe there is no recovering from them. If there’s anything I’ve learned from studying creative people, it’s that they are unafraid to take chances. They leap into challenges head first. They treat failures as a chance to learn instead of as an indictment or themselves and their work. When they fail, they look at that experience and ask themselves “What could I have done better?” That’s exactly what we all need to do. Stop getting down on yourself for making a mistake. Everyone makes mistakes, but not everyone learns from them. We need to be more bold in our thoughts and our actions. So go out there and take chances. Don’t worry about making a mistake. Mistakes are the foundation of learning. Sometimes people forget we aren’t the masters of the universe. We are so busy thinking about ourselves that we fail to think about our place in the universe. Years ago we thought we were the center of everything, and why wouldn’t we. The sun appeared to revolve around us. We were the smartest beings on the planet. We had yet to make discoveries about the universe. But once we studied the world enough, we began to realize how small we are. We aren’t in the center of the galaxy. We aren’t the center of the universe. The world does’t revolve around us. We are just the result of millions of years of time and good luck. When we take a good, long, look at the world, we realize how inconsequential we are. That’s why mountains seem tall. That’s why the Earth seems eternal. That’s why the universe seems vast. While many people feel insignificant when faced with these facts, I feel empowered. Our lives, in the grand scheme of things, mean very little. That means we should pursue the things that interest us. We should study the things that we find fascinating. We shouldn’t be afraid of going after the things that mean the most to us. We have a limited amount of time in this world. So why don’t we live life the way we want to? If you have a dream, go chase it. If you’ve been holding off on a project, start it. There’s nothing to fear but fear itself. When all is said and done, you will have either lived life to the fullest, or you will have died regretting the things you didn’t do. The universe isn’t affected by what we do or don’t do. So make the biggest dent in the world that you can. For some reason, we believe there’s a tipping point where we no longer have worries. We believe, with enough money, we no longer have struggles, fears, or doubts. But that’s simply not the case. We like to make excuses for why we can’t accomplish our goals. “I don’t have enough money.” “I don’t have the time.” “I don’t have the right connections.” That’s all these things are. They’re just excuses. If you think your favorite painter, actor, musician, or writer doesn’t have to deal with struggles, you couldn’t be further from the truth. Just because someone has a lot of money or fame doesn’t mean they don’t have struggles too. These people all came from different backgrounds. They have different identities. And they are well-known for very different reasons. But one thing they all understood, was, life is a struggle. It doesn’t matter who you are, you will face adversity. It is by overcoming that adversity that you become great. The next time you think someone else’s life is perfect and free of worries, think again. We must all face the challenges in front of us and overcome them. It’s what makes life worth living. We need to learn to appreciate each moment on our journey. One of our biggest faults is looking at what other people are doing and being envious of their success. Even though we know this intuitively, it’s still hard to do. We ask ourselves why that person has success and why we don’t. The problem with this line of thinking is, that person probably spent ten years getting to where they are. Instead of looking up at other people, we need to learn to appreciate where we are in the process. The best way to do this is by recognizing our paths aren’t a straight line, they’re a journey. One thing I have to constantly tell myself is to focus on what I’m working at the moment instead of worrying so much about the end result. When I stay present and focus on the now, I tend to enjoy my work a lot more. Even though it may not feel like it, these little moments form who you are as an artist and as a person. They are the checkpoints along your journey. When you recognize these moments, your work can feel magical. When you don’t, your work can become unfulfilling. If you find yourself yearning for instant success, you need to ask yourself these questions: Is instant success all it’s cracked up to be? Would you know what to do with it? Would you truly appreciate what you have? Keep these questions in mind the next time you are feeling envious of someone else. Reflect back on your work. Feel gratitude for what you’ve been able to accomplish. When you lose sight of your journey, you lose sight of who you are. Appreciate the little things. These moments are what makes life so enjoyable. There are two major mistakes artists make about money. The first is, they believe in the myth of the starving artist. The second is, they believe they shouldn’t need to make money from their art. The starving artist myth is prevalent in society. We believe artists must suffer to create great work. We believe you have to live at end’s meet. We believe you can’t be a prosperous artist. I’m not sure why this myth has prevailed. There is so much evidence to the contrary. Artists of all kinds are able to make a living from their work. Are they all rich? No, but they aren’t starving either. There are musicians, illustrators, actors, writers, and artists of all kinds creating great work and making a living from doing it. The second mistake artists make, is believing we shouldn’t have to make money from our art. While it’s true that we don’t have to sell our work to be artists. It’s also true that if you want to make a sustainable living as an artist, you have to sell your work. Walt Disney was one of the greatest visionaries of his time. He completely revolutionized animated films. Why did he do it? He wasn’t interested in making movies to become rich. He did it because he had a vision and story to tell. While making his first full-length animated film, Snow White, Disney went far above the initial budget of the film. He could have released a cheaper version of the film to make more money, but he wanted to make it as perfect as possible. He wanted people to be so entranced by the film that they would forget they were watching an animated movie. And it worked unbelievably well! 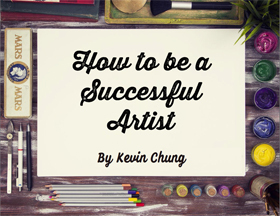 If you want to be a successful artist, you can’t be afraid to make money for your work. You can’t fall victim to the myth of a starving artist. You have to be willing to make money from your art. Not because you want to become rich, but because you want to make more art. The best way to become a thriving artist is to get over your insecurities over money. Money is just a means to create a sustainable living. It allows you to live comfortably while also creating art. Don’t create art to make money. Make money so you can create more art. For more great info on this topic, check out my review for Elizabeth Hyde Stevens’ Make Art Make Money. H/T quote via Austin Kleon’s Show Your Work!